ABC News 20/20, Caritas, and its founder worked together on a special piece about Medjugorje for the 20/20 news program. This later resulted in the one hour documentary with Martin Sheen. After months of interviews, the name of the documentary became known as “The Lasting Sign”, a name signifying a wonderful, tremendous miracle to appear upon Apparition Hill directly by God. 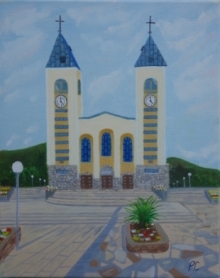 Mirjana, one of the six visionaries of Medjugorje, was the first visionary to receive all the Ten Secrets. Our Lady has given her the responsibility to reveal the secrets to the world when it is time. Our Lady gave Mirjana a parchment with all the secrets written on them. It is made of a material not found on this earth. The following is an interview with Mirjana in June of 1988 during the filming of the Caritas Medjugorje Documentary called The Lasting Sign. Mirjana, at this time, was not married and living in Sarajevo with Her family. Mirjana was asked about the parchment given to her by Our Lady containing the Ten Secrets. The Blessed Virgin Mary has told the visionaries of Medjugorje that She would impart to them Ten Secrets. Very little is known about these secrets, though we do know that some of them have to do with chastisements for the world. We also know that the third secret will be a visible, lasting sign that will miraculously be placed somewhere on Apparition Hill. It will be permanent, indestructible, and beautiful. Also, both Mirjana and Vicka have stated that part of the seventh secret no longer exists because of the prayers and fasting of the people responding to Our Lady’s call.